David Ron: Zooming PDF files for Nook. Zooming PDF files for Nook. Install pdfedit. Under Ubuntu, it's found in the Synaptic Package Manager for one-click installation. Under Windows, the installation process is quite involved. 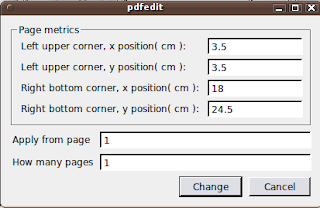 Open your e-book in PDF edit. 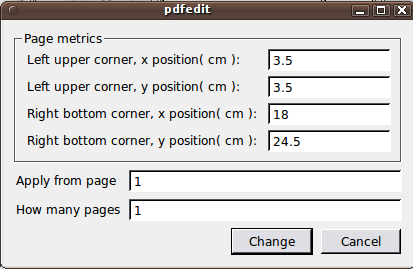 Adjust the top four boxes until the PDF is cropped the way you want it to be for the current page by changing one at a time, and applying it to the page. Don't worry, no data is lost, and you can always just change the number back if you make a mistake. Once you are sure that the numbers are set the way you want them, adjust the bottom two boxes to change all pages (Apply from = 1, How many=999999999). Before doing step 2, you may have to open pdfedit and before opening a pdf, delinearize your PDF using the Tools->delinearize option to open the original pdf and re-save it to another file.